Bryce Harper's many talents now include hat designer. The Washington Nationals outfielder has created a limited edition baseball cap that went on sale Wednesday. Proceeds will go to Harper's Heroes -- a charity for children battling cancer -- as well as the Leukemia & Lymphoma society. "I''m really hoping these hats sell and shed some light on a good cause,'' Harper said Tuesday. Harper went old-school in creating the design. "I wanted it to be an old-style cap, kind of like the old L.A. Dodgers hat and the old New York Yankees hat that celebrities wear. That kind of thing," he said Tuesday. "I wanted it to be super simple with the Harper's Heroes logo on it." 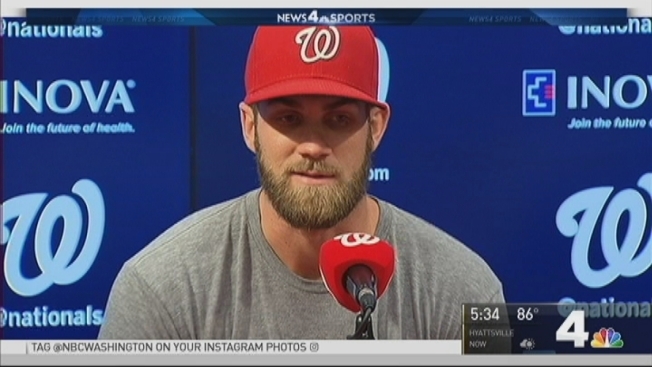 The New Era cap was unveiled Wednesday at a news conference at Nationals Park. Harper, the 2015 National League MVP, will serve as one of the main promoters for the hat. "I'll be wearing it for interviews and things like that," he said before the big reveal. "I'll have it Wednesday, will wear it after the game and see what everybody thinks." Harper is more interested in raising money for charity than getting positive reviews on his handiwork. "It's something I hope everybody goes out and buys -- not just to support Harper's Heroes but for cancer research," he said. "That's something very big to me."